Note: In August 2012, Yuvi’s book, now titled A Brilliant Novel in the Works, was released by MP Publishing. Here’s a more recent interview with Yuvi. Yuvi’s story “God and Buses” was published in Glimmer Train, Spring 2011, Issue 78. His work has appeared in Narrative Magazine, Rosebud, Carve Magazine and the Clackamas Literary Review, among others. His story “Love” will be published in the LA Review later this year. 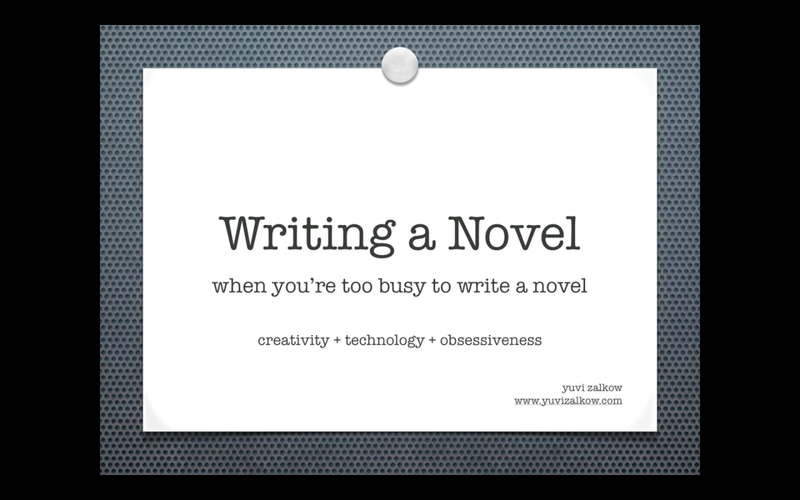 This is the opening screenshot for Yuvi’s presentation about fitting novel-writing into a busy schedule. Yuvi, a Portland, Oregon, resident, recently earned a master’s degree in creative writing from Antioch University. His completed novel is titled NOT IN MY LIFETIME, and he’s working on the next one. He’s a technical writer by trade. As if that doesn’t keep him busy enough, Yuvi has been creating informative and hilarious presentations on various writing-related subjects, including a 48-minute one on getting the most out of Scrivener, and a 10-minute segment titled “Writing a novel when you’re too busy to write a novel.” His latest one, “I am a failed writer: Revisions,” should be required viewing for anyone wrestling a first or second draft. It’s brilliant. Honest. Go watch it. Right now. Then come back here to read more about its creator. I met Yuvi in the weekly writing classes led by Joanna Rose and Stevan Allred in 2006 (or thereabouts), and as one of his many fans, I’m so excited to feature him today. I always approach his stories with a smile, and in fact, there’s a huge grin on my face right now. Welcome, Yuvi! 1. Tell us about your completed novel, NOT IN MY LIFETIME. That was a really fun one to write. It’s a novel about a neurotic Jew writing a novel. Not much of a stretch… The novel started by mistake, which I’m sure isn’t so uncommon for writers. I was simultaneously writing a lot of personal essays about my childhood in Georgia while writing this story about this neurotic writer who was struggling with his writing (and with his gentile wife) (and with his sexual perversions) (and with his brother-in-law’s gastrointestinal troubles) and then I realized that these two projects were colliding. The essays informed the fiction and the fiction informed the essays. I actually lost track of what were real stories and what were made up stories. I’m still trying to find the right home for this novel. The bigger agents I’ve spoken to were not so thrilled about the idea of trying to sell multi-layered neurotic Jew meta-fiction [my interpretation]. But I’ve still got some onions in the fire [to make up a phrase]. I’m writing a more regular novel. By regular, I mean I still couldn’t get away from Georgia (and Jews), but this time it’s about Polish Jewish immigrants who move to rural Georgia in 1938. Finally, a story that doesn’t have Yuvi in it as the main character… It’s pretty challenging trying to keep this thing on the tracks but it’s been a great exploration for me. I think (I hope) (pppplease let it be true!!!) that I’m learning how to write something more than just an autobiographical story. This one is taking me deeper into other people’s minds and it’s going well, though I wish it were moving faster. 3. Your writing is so amazingly laugh-out-loud funny without sacrificing content, characterization or weight. Any tips on being hilarious on the page? Wow. Thank you for the kind words. Hmmm. Tips. Well, for me it starts with shame. I’m oozing with shame. But it’s more than just shame. Shame alone is pretty tedious to read about. Once I went through enough therapists to stop taking myself so seriously, then my shame started to come off funny. I actually had not even thought of this stuff as funny until I started reading my work to others (thank you Stevan Allred and Joanna Rose!). Who would’ve thought it was funny that I pee sitting down because I’m too nervous to do it standing? 4. You have been creating fantastic online presentations about writing, such as this one about your desk. Why did you decide to explore this format? Do you write a script before recording? What kind of technology do you use? And how does recording a visual essay differ from writing a short story or essay? 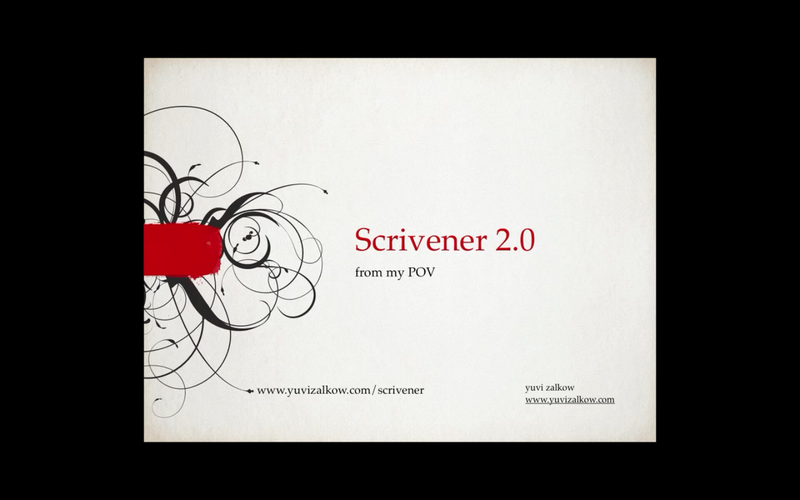 Yuvi’s a huge fan of Scrivener, and he has created a 48-minute presentation about the program. This has been an unexpected twist for me. It started because I had to give a lecture in order to graduate from Antioch with an MFA. I was terrified of giving the lecture but I knew I had a lot to say about the persistence required for the submission process. So I pre-recorded a 20-minute presentation to get the audience warmed up without requiring me to perform on the spot. Anyway, the lecture went just fine (both the pre-recorded part and the live part), but more interesting was that making the presentation was a blast. So I kept on experimenting with presentations, and doing screencasts of the software I use to write, and various other things (like my messy desk). My method is pretty inefficient at this point. I tend to make it up as I go the first time, but then that usually turns out too sloppy and so then I transcribe the tricky parts and re-record most of the audio. And then I start injecting little bits of eye candy to keep it from getting boring. Very zig-zaggy process at this point, but it’s still a lot of fun. I’ve been using a Mac pretty intensely for about a year now and discovered some amazing tools for both writing and creating presentations. At the core of the presentation process is Keynote for doing the presentations and ScreenFlow for capturing the screen and recording the audio. Various other tools here and there for the animation. Doing things visually seems to use a different part of my brain than writing a story, so I use this as a break from the writing. One thing that is similar between writing and making presentations is this. I picture my desired audience and then at every second I keep asking myself: Is it still interesting? Is it still interesting? Is it still interesting? Is it still interesting? Are you still there? Have I lost you? I’m a pretty obsessive to-do list maker. Sheri (my wife) will tell you the absurdity at which I rely on my task management software (mmm… OmniFocus). I don’t do anything that OmniFocus hasn’t approved of. If OmniFocus told me to jump off a bridge, I’d do it—especially if it told me which bridge to use and which project this task was associated with. But on a slightly more serious note, having a baby was awfully effective in teaching me to focus on only the most essential things. It’s amazing how many things you can drop on the floor without getting arrested. But I try not to drop the big things: the family, the writing, the martini. 6. Your persistence to find homes for your stories has paid off with many acceptances from literary journals—and many rejections, too. Tell us about your quest to get a story published in Glimmer Train. Any advice for writers who are frustrated by rejections? A Glimmer Train publication was something I’d been dreaming of for over ten years. My “Poop to Glimmer” presentation talks about this in more detail but I just found a way to work the submission process into my life without ever taking it too seriously, or too lightly. I don’t know if this works for all writers, but I just tried to keep submitting at a certain rate (say 10 places a month with various stories) without even thinking about it too much. I’d get a rejection and I’d mark that submission off the list and that simply meant that I had another one to send out. I was more like a detached secretary with regard to this process. Sounds kind of boring, huh? Unfortunately, one of the tasks I’ve dropped on the floor recently is my submission regiment. But I’m allowing myself to mostly focus on the novel writing for now. 7. In “From Poop to Glimmer,” you mention rereading as a way to analyze and understand great stories, such as Tobias Wolff’s “The Liar.” Please share some more of your favorites so we can learn from them, too. Why have these particular works amazed or inspired you? I’ve always been drawn to a strong voice. The storyteller has to grab me quick. I honestly think I’m too slow and dumb a reader to stick with a difficult or awkward storyteller. I know I’ve missed out on some great literature because of this weakness, but that’s the way I am. As for short stories, I’ve studied Raymond Carver and Tobias Wolff quite closely. They’re great storytellers. Also there’s this short story (“Conversion of the Jews”) from one of Philip Roth’s first books that I keep returning to as I re-think the concept of a character arc. And Tim O’Brien’s “The Things they Carried” (I’m talking about the short story in this case) is relentless and amazing and worth studying closely for how that story builds and builds. As for some of the novels I’ve recently been obsessed with, there’s “The Razor’s Edge” by Somerset Maugham. I’m amazed how effectively the narrator gets away with how he tells that story. “Billy Bathgate” by E.L. Doctorow has got an amazing authority to the voice.”Herzog” by Saul Bellow is shocking to me in how Bellow tells a story in third person that seems closer into the man’s consciousness than even a first person account could render. Oh. Also. James Baldwin’s “Sonny’s Blues” blew my pants off it was so good. Is that a good way to end this discussion? With pantslessness? Thanks for talking to me, Laura. 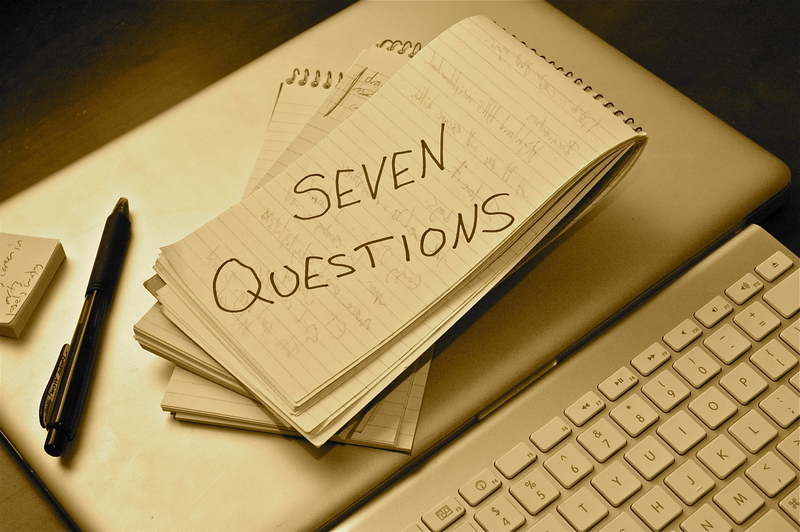 Thanks for participating in Seven Questions, Yuvi! Stop by his website, www.yuvizalkow.com, to learn more about his career and to watch his entertaining presentations about writing-related topics. You’ll laugh. You’ll learn a lot. You’ll want to send links to everyone you know. This entry was posted in Fiction, Seven Questions, Writing and tagged Glimmer Train, interview, novel, rejections, Scrivener, submissions, writing advice, Yuvi Zalkow. Bookmark the permalink. Scrivener is changing my writing organization for the better. I can’t believe I spent so many years scrolling through word. I’m not an organized person, but I want to be. It makes it so easy for even a pantser to find structure. I’ll have to check out the presentation when I get a free moment. Thanks! How is it that you (Yuvi) grab the essence of a writer’s angst so succinctly? Great interview.